18 - 4 parallel dots (Neer Pulli) Kolam - Start with 18 dots - 4 lines. Leave one dot at both ends and stop at 4 by putting parallel dots at both sides. Tried this kolam but made modifications. Came out really well. Thanks! Nice to hear that you tried this kolam with some modification. Can you please share that kolam with other users. If you can, you can send it to me so that I can publish with your name. Thank you for visiting my site. Wishing you and your family a very haapy Pongal and New Year. I just discovered your site 2 weeks ago! I love it! You have done a trememdous job of posting the directions and variety of Kolangal. I want to thank you for inspiring me to create a special design. I am a quilter and decided to quilt something special for my parent's 50th wedding anniversary. Your Kolam 102 was the perfect fit. I drafted it and created templates. The quilt was made using my Mom's old sari blouses and my Dad's "pattu veshti". I loved your color choices and copied them also. I named the quilt "Kalyana Kolam"! Thanks for the inspiration and wish you all the best. I will be a regualr visitor now. 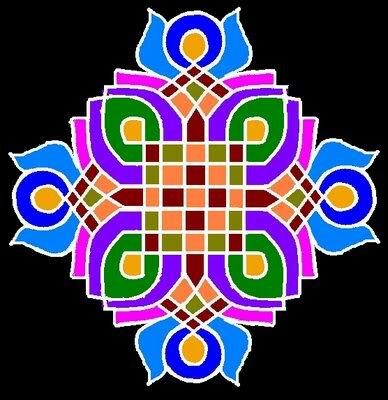 Thank you very much for visiting my site and your attempt to quilt this kolam. It is really nice to hear my kolams are somewhat useful to others. My hearty congratulations on your Parents 50th wedding anniversary.